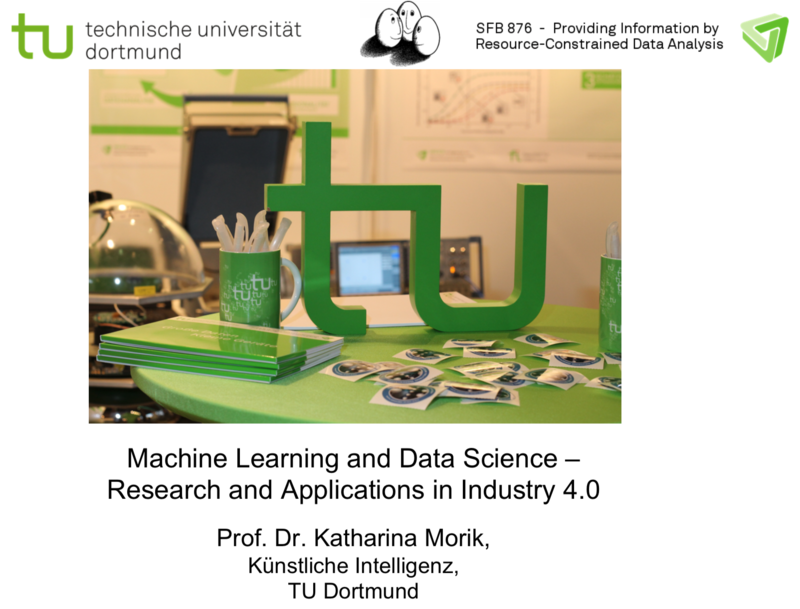 What is the impact of AI for industrial systems Speaker: Prof. Dr. Katharina Morik, Chair of Artificial Intelligence, TU Dortmund University AI has raised some interest, recently. The driving force behind this hype is machine learning, in particular deep learning. This talk sketches the current hot topics and then focuses on what is relevant for applications in industrial processes. Prof. Dr. Katharina Morik Head of Artificial Intelligence Unit, Chair of Artificial Intelligence, TU Dortmund University Katharina Morik obtained her PhD from University of Hamburg in 1981 and her habilitation from Technical University of Berlin in 1988. Industry Applications of Machine Learning and Data Science Speaker: Ralf Klinkenberg, RapidMiner This presentation provides an overview of industry applications of machine learning and predictive analytics in the automotive, aviation, chemical, manufacturing, pharmaceutical, steel, and other industries covering the following use cases: Predictive Maintenance: Predicting and Preventing Machine Failures before they happen. Prediction, Prevention, and Resolution of Critical Situations in Continuous Production Processes. Product Quality Prediction in early stages of the production process. Predictive Quality in Electronics Manufacturing Speaker: Dr.-Ing. Jochen Böning, Siemens AG Due to the increasing competitive pressure of globalization, the production of high-quality products is crucial for the long-term success of a company. In order to guarantee the delivery and transfer of faultless products, it is therefore essential to ensure quality. In the classical sense, this is in turn associated with high testing volumes, so that on the one hand high investments are made for testing equipment and on the other hand high testing costs are incurred. 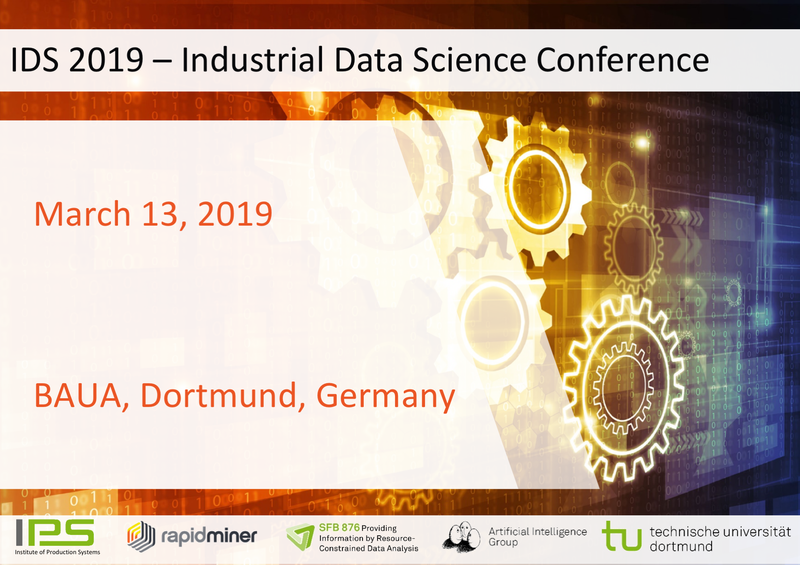 Welcome to IDS 2017 and Overview of Data Science Use Case Presentations Speaker: Ralf Klinkenberg, RapidMiner Download the talk: here Welcome to the first Industrial Data Science (IDS 2017) conference in the name of the whole organization team. 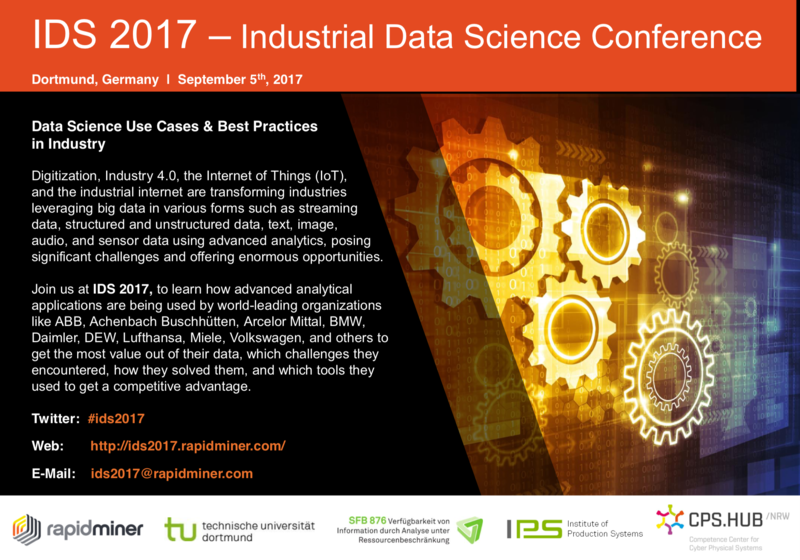 After a short description of the state, challenges, barriers, use cases, and opportunities of Industrial Data Science and of the CRoss- Industry Standard Process for Data Mining (CRISP-DM), which is used as a redline through this event, we provide a short overview over the data science use cases presented at IDS 2017, whose presentation order reflects the steps in CRISP-DM. Machine Learning and Data Science: Research and Applications in Industry Speaker: Prof. Dr. Katharina Morik, Head of Artificial Intelligence Unit, TU Dortmund University Download the talk: here Prof. Dr. Katharina Morik, head of the artificial intelligence group at TU Dortmund University and speaker of the collaborative research center SFB 876 on machine learning under resource constraints, provides an overview of machine learning and data science research and applications in industry.